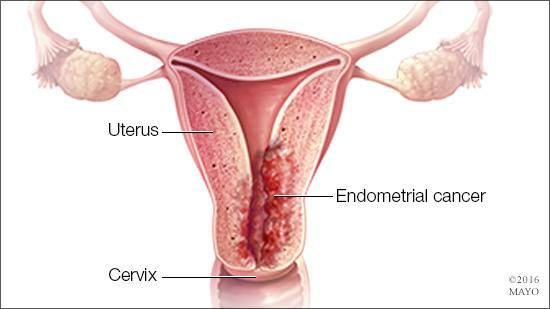 Endometrial cancer begins in the layer of cells that form the lining (endometrium) of the uterus. It is often detected at an early stage, because it frequently produces abnormal vaginal bleeding, which prompts women to see their health care providers. If endometrial cancer is discovered early, surgically removing the uterus often cures it. Learn more about the symptoms, risk factors and prevention, and when you should see your health care provider. Breast implants and cancer: Is there a connection? The U.S. Food and Drug Administration has identified a possible association between breast implants and the development of anaplastic large cell lymphoma, a rare cancer of the immune system. Any association between breast implants and cancer is concerning. Still, it's important to keep the potential risk in perspective. Learn more from Dr. Sandhya Pruthi, a Mayo Clinic family physician and past director of the Mayo Clinic Breast Diagnostic Clinic. Inflammatory breast cancer is a rare type of breast cancer that develops rapidly, making the affected breast red, swollen and tender. It occurs when cancer cells block the lymphatic vessels in skin covering the breast. Inflammatory breast cancer doesn't commonly form a lump, as occurs with other forms of breast cancer, and it can be confused with a breast infection. Learn more about the symptoms and risk factors, and when you should seek medical care. Consumer Health: How much water do you need?